The Battle of Maipo was fought on 5 April 1818 between the Patriot forces of San Martin and the Spanish Royalist army commanded by General Mariano Osorio. Maipo is situated near to the Chilean capital of Santiago and this was the decisive battle of the liberation of Chile from Spanish rule. At the beginning of the 19th century the Spanish Empire in South America consisted of three Viceroyalties; New Grenada in the north, Peru that included Chile and La Plata covering mostly modern day Argentina. These were the territories grabbed by the conquistadores in the 16th century. Spanish rule was one of complete political and mercantile control but by the start of the 19th century the ideas of the North American and French revolutions were spreading to South America. They attracted limited support from the American born Spaniards although it was the dislocation caused by the Peninsular War in Europe that led to the establishment of local Juntas and then to the independence movements that resulted in the wars of liberation. The outstanding generals of the wars accorded the title of ‘Liberator’ were Simon Bolivar who liberated the north and Jose de San Martin who led the forces from Argentina into Chile and then Peru where he joined up with Bolivar. 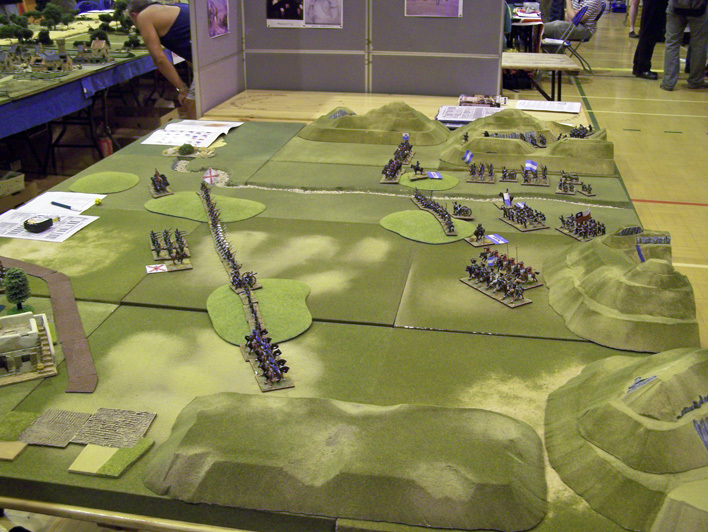 This series of demonstration games depicts the southern campaigns of San Martin. The key to Spanish control was the most Royalist of provinces Peru. San Martin’s plan was to liberate Chile from Argentina and then move up the coast to Peru. This involved crossing the Andes with his Army of the Andes in January 1817, split into four columns using different passes of between 3,500m and 5,100m high. The columns united at Chacabuco on 12 February where they defeated a strong Royalist army. San Martin then captured the capital Santiago. There followed another year of campaigning in Chile until a Royalist army commanded by General Osorio came down from Peru and defeated Patriot armies at Talcahuano and then at Cancha-Rayada on 16 March 1818. San Martin regrouped at Santiago and met Osorio at Maipo on 5 April. Spain found it difficult to provide troops for its South American colonies so in the main they had to rely on locally raised militia units (Andean indians) stiffened by peninsular veterans. Infantry battalions mainly fought in the traditional line formation with grenadiers and cazadores often fighting in detached formations. The cavalry was poorly mounted and inferior to their Patriot opponents. Artillery was mostly of light calibres reflecting the mountainous terrain and used as fixed position guns to soften up the enemy line. Patriot armies largely consisted of lower class troops, including freed slaves, commanded by Creole officers. The core of the Army of the Andes was the veteran Argentine line regiments supplemented by less experienced Chilean National Guard units. The strength of the Patriot forces was the cavalry including San Martin’s famous Horse Grenadiers. 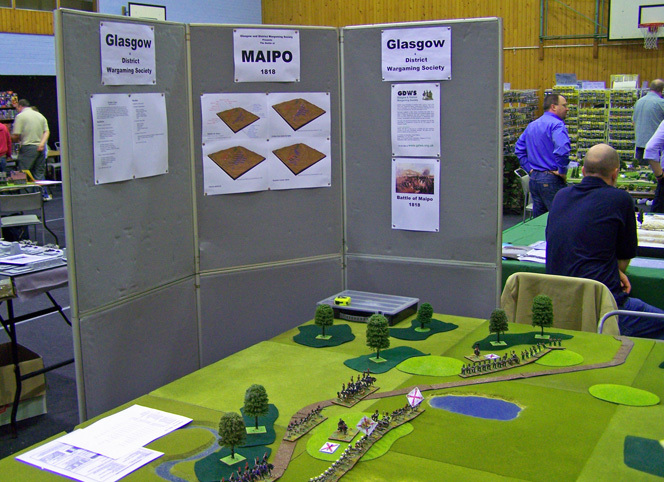 As with the Royalists, artillery was poorly utilised spread amongst the infantry units for position support. The battle opened with an ineffective artillery duel followed by an advance from the Patriot line. The right wing routed the Royalist cavalry and captured a battery. However, the left wing was stopped and only the reserve artillery stopped the Royalist counter attack. San Martin then ordered his mounted Cazadores to flank the Royalist left. They drove off the Royalist cavalry and crashed into the veteran Burgos Regiment. When this gave way Osorio panicked and ordered a retreat. Colonel Ordonez took over command and rallied a sizable force at Los Espejo farm that repulsed the Patriot assaults until San Martin brought up artillery support and forced the Royalist surrender. The Royalist army was totally crushed and Chilean independence was secured. Over 1500 Royalists and 1000 Patriots were casualties in the bloodiest battle of the war. 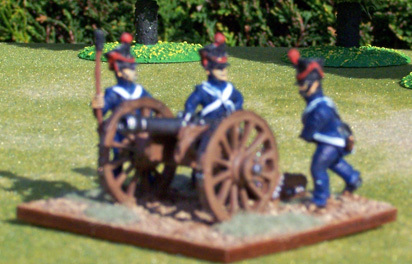 The battle is re-fought using 28mm figures primarily from the Front Rank Napoleonic range supplemented by Perry figures from their Napoleonic and Carlist ranges plus one unit from the Cannon Fodder Alamo range. The buildings are from Grand Manner. 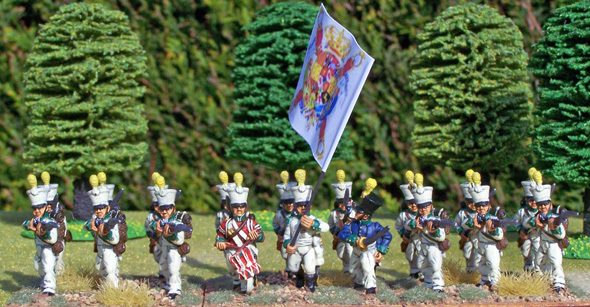 There are no figures produced specifically for this conflict so some conversion is required although the armies used typical Napoleonic dress and tactics of the period. The biggest gap is Gaucho and Llanero figures. The best English language history of these wars is ‘Liberators’ by Robert Harvey. Also on the web there is ‘Regiments of America’ http://www.geocities.com/regimientosdeamerica/index2.html. 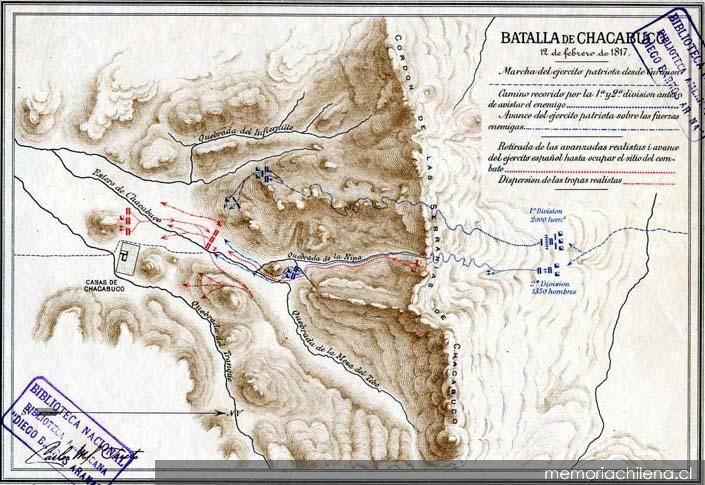 The Battle of Chacabuco was fought on 12 February 1817 between the Patriot forces of San Martin and the Spanish Royalist army commanded by General Rafael Maroto. Chacabuco is situated in the foothills of the Andes in Chile. It was the first battle of San Martin’s Chilean campaign that resulted in the liberation of Chile from Spanish colonial rule. The outstanding generals of the wars accorded the title of ‘Liberator’ were Simon Bolivar who liberated the north and Jose de San Martin who led the forces from Argentina into Chile and then Peru where he joined up with Bolivar. 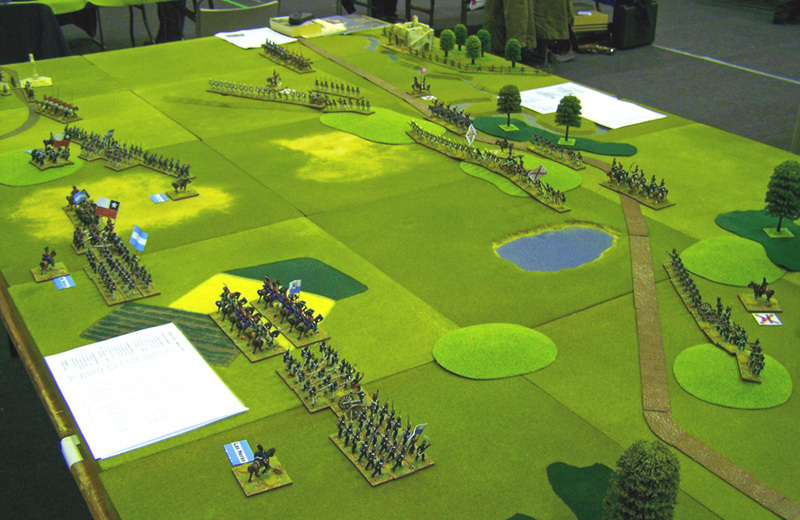 This series of demonstration games by GDWS depicts the southern campaigns of San Martin. The key to Spanish control of South America was the most Royalist of provinces Peru. 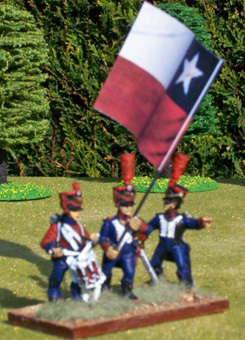 In three campaigns between 1810 and 1815 the Patriots had failed to break into Peru from Northern Argentina. San Martin’s plan was to liberate Chile from Argentina and then move up the coast to Peru. This involved crossing the Andes with his Army of the Andes in January 1817, split into four columns using different passes of between 3,500m and 5,100m high. The Army of the Andes suffered heavy losses during the crossing, losing one-third of its men and more than half of its horses. The Royalist forces had rushed north to respond to their approach, and a force of about 1,500 under Maroto blocked San Martin's advance at Chacabuco. All he had to do was delay San Martin, as he knew that further Royalist reinforcements were on the way from Santiago. San Martin knew this as well, and opted to attack whilst he still had the advantage of numbers. San Martin divided his army into two divisions. The first, under General Bernardo O'Higgins, was to fix the attention of the Royalist force to their front, whilst the second, under General Soler, was to move around their left flank. Unfortunately, the flanking force experienced a series of delays, and, as the day wore on, O'Higgins found himself confronting the majority of the Royalist army in an exchange of fire over a deep creek. Taking decisive action (although disobeying orders), O'Higgins ordered a general advance and attacked the Royalist line. 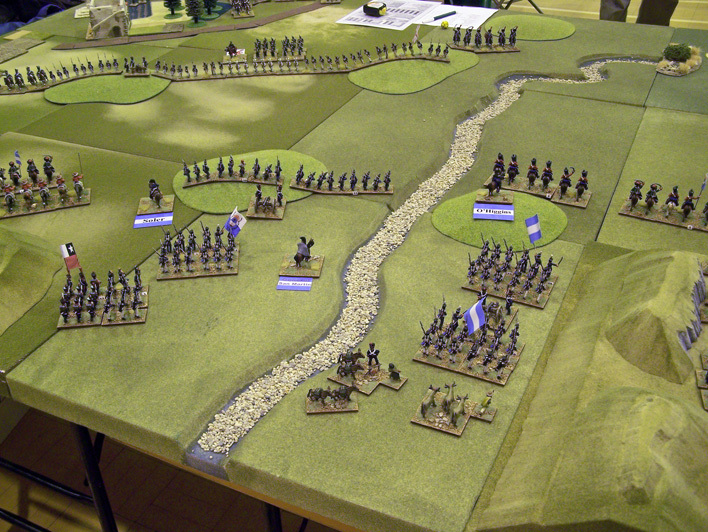 The line buckled under the attack, allowing O'Higgins' cavalry to sweep through. The defeated Royalists retreated towards Chacbuco farm. In the meanwhile, San Martin had personally gone to find the flanking force, and with his arrival turned the Royalist retreat into a rout. 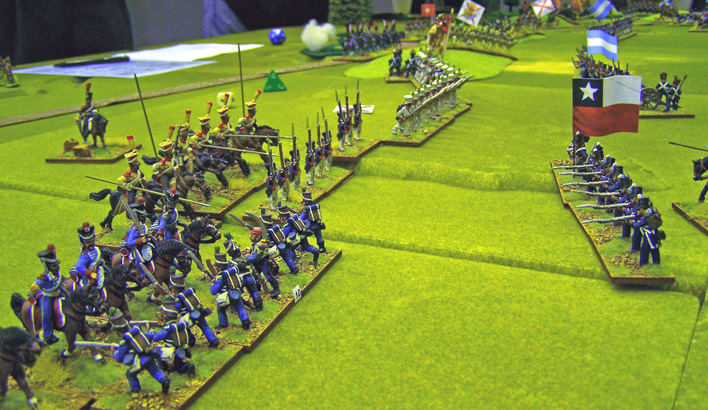 For this wargame scenario we have assumed that the Royalist reinforcements came up quicker than their historical reinforcements making a more interesting and balanced game.